Marvel’s Black Panther has opened to critical acclaim and a boffo box-office that insures we’ll be seeing another Black Panther film at some point in the future. Between the Panther’s success and that of the Black Lightning and Luke Cage shows, I’m hoping we will see more heroes of color on the big and small screen. Off the top of my head, I’d watch movies or TV series of Ms. Marvel, Ironheart, Moon Girl and Devil Dinosaur, Static, Cyborg, Icon and Misty Knight. If I thought about it longer, I’m sure I’d be able to add several more names to that list. I saw Black Panther the day after it opened. It had a large crowd for a Friday afternoon, especially considering it was playing on a number of screens in our local multi-plex. The film most definitely lived up to its advance buzz. Black Panther is more than a super-hero movie. It’s a spectacle of startling proportions and an intense political thriller. Wakanda, the setting for most of the action, is breathtaking in its natural beauty and its technological wonder. This is the Wakanda created by Stan Lee and Jack Kirby, a seamless merging of the country’s dual aspects. 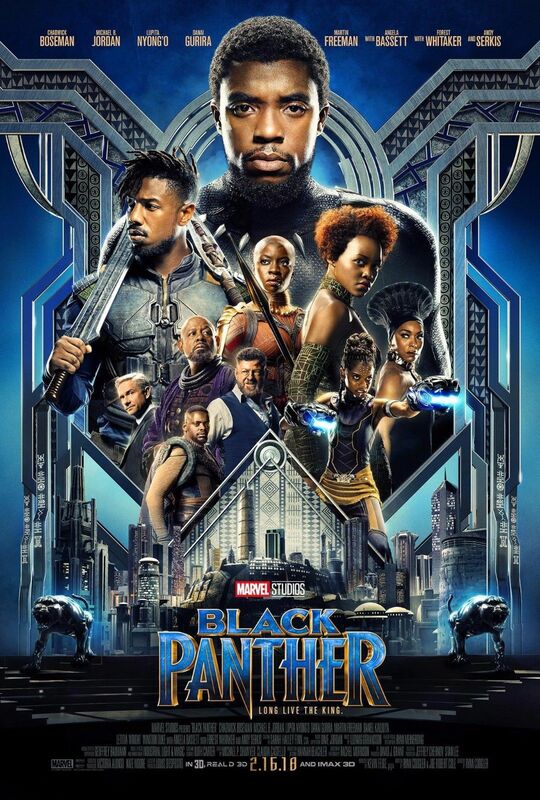 The movie is just as exciting when the Panther tracks down stolen vibranium in South Korea. The choreography of the firefight in the casino and the chase scene that follows it is masterful. Chadwick Boseman is transcendent as T’Challa, the new king charged with protecting his people’s safety and traditions while realizing they can no longer stand aloof from the rest of the world. He faces dangers from within and without his land. Michael B. Jordan’s Erik Killmonger is terrifying. His skill as an assassin is scary enough, but, added to his plan to make Wakanda a conqueror nation, he immediately moves to the forefront of Marvel movie villainy. That he’s not entirely wrong about some policies of Wakanda makes for some chilling moments. There are many fine performances in the film, but I have to single out those of Martin Freeman and Letitia Wright. Freeman plays CIA agent Everett K. Ross and the interpretation is a vast improvement over the comic-book version of the character. Wright plays Shuri, the absolutely adorable and genius kid sister of T’Challa. I’d love to see Shuri recruited by the Avengers, if only to see her playing against Tony Stark. I love Black Panther on several levels. I love its grandeur and its thoughtful approach to the issues facing Wakanda and the world. I love seeing so much of Lee, Kirby, Don McGregor, Rich Buckler and other comics creators in this movie. I love that it’s a different take on a Marvel super-hero film. I love the acting and the writing and the directing and every other creative and technological thing that went into the making of the movie. Black Panther is my pick of the week. Is it too early for me to put in an order for the Blu-ray? 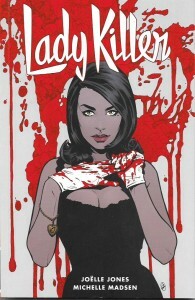 Lady Killer 2 by Joëlle Jones and colorist Michelle Madsen [Dark Horse; $17.99] continues the “adventures” of Josie Schuller, a 60’s housewife and mother who moonlights as an assassin. The dark comedy gets darker this time around with Josie working for herself instead of the agency that formerly employed her. Some scenes of a younger Josie inform the woman she has become. Before the end of this gore-soaked sequel, Josie faces some alarming consequences. These were disturbing, but, ultimately, have me hoping Lady Killer 3 will be coming our way soon. What hasn’t changed in this second volume is Josie’s uncanny sense of 1960s style. She makes me wish those fashions would come back. What also hasn’t changed is how good Jones is in her duel roles as writer and artist. This is a well-told story with gorgeous art and solid storytelling. If you liked Lady Killer, you’ll like Lady Killer 2. It’s edge-of-your-seat comics with some surprising scenes. If you haven’t read Lady Killer, you should. It’s one of my favorite comics series of the new millennium. On the recommendation of a critic who loved Black Lightning: Cold Dead Hands and thus established his good taste, I read Spirits of Vengeance #1-5 [Marvel; $3.99 per issue]. 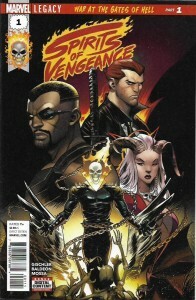 This unlikely teaming of the Johnny Blaze Ghost Rider, Blade, Damion Hellstorm and Satana is written by Victor Gischler, whose work I have enjoyed previously. Rather than keep you in suspense, I’ll let you know up front that I enjoyed his work here as well. There are some choice plot drivers in this story. The Covenant is an ancient diplomatic summit between an agent of Hell and an agent of Heaven to hash out any violations of their agreements that have been in place since the dawn of mankind. Then there’s a weapon made from the thirty pieces of silver paid to Judas for betraying Jesus to the Romans, a weapon which could be a game-changer in that war between Heaven and Hell. Gischler does a great job writing all the characters in this story: the good, the not-so-good, the not-so-bad and the bad. Artist David Baldeon does a good job with the “normal” scenes and great balls of fire with the supernatural stuff. Color artist Andrea Morra does a fine job tying it all together. Spirits of Vengeance [$15.99], collecting all five issues, will be published in April. If you like Marvel’s supernatural characters, you’ll like this entertaining story. Want to see me in March? I’m sticking close to my home in Medina, Ohio that month. I’ll be appearing at Cleveland Concoction, a multiple fandom event that takes place March 9-11 at the Bertram Inn & Conference Center in Aurora, Ohio. The show prides itself on being “by the fans, for the fans” and also calls itself “Your fandom escape by the lake!” It should be great fun and, with three days of that fun, I should have all sorts of time to chat with and hang out with the fans who attend. I’d love to see you there. I’ll be back next week with another batch of reviews and the news of where else I’ll be appearing in March. It’s mid-February as I write this column. We’re five episodes into the Black Lightning TV series and four issues into Black Lightning: Cold Dark Hands. I’m feeling great about both. Black Lightning is a blessing. I feel blessed to be associated with the character and to be here today to see how much he means to the readers and the viewers. I feel blessed the people at DC Comics and the TV show have made this possible. I love getting complements on “my” show and, yes, I do see a lot of myself in this series. But the vast majority of the credit for this show we love should go to Salim and Mara Brock Akil, the writers and the most incredible cast on TV. Cress, China, Nafessa, Christine, Marvin, James, Damon and all the supporting players. I’m very proud of my creation, but, thanks to these actors, I feel like every Tuesday night is Christmas. What a special gift they give me and the legions of Black Lightning fans. Black Lightning: Cold Dead Hands has been the best experience of my 45 years in the comics industry. Artist Clayton Henry knocks it out of the park with every page he draws. Yvel Guichet has come out of the bullpen to provide some fine relief drawing. Peter Pantazis’ coloring is the best my stories have ever had. Letterer Josh Reed makes my words look good. And I can’t say enough good things about editors Jim Chadwick and Harvey Richards, who give me the very best notes I’ve ever received from editors. They don’t try to get me to tell their stories. They get me to tell my stories better. Indeed, every one who is involved in this six-issues series at any level is making me look real good. Of course, Black Lightning isn’t the only thing I’m looking forward to this month. When I finish this week’s column, I’ll see Marvel’s Black Panther at the local movie house. Look for my review of that film next week. 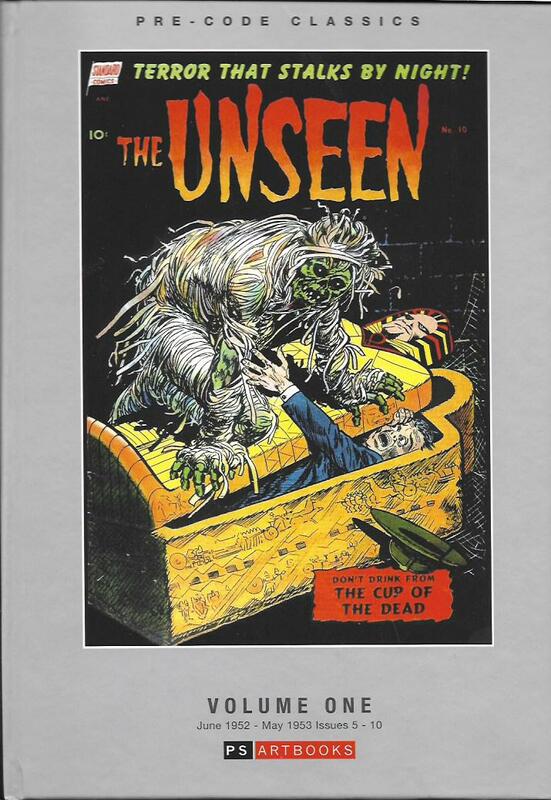 If you’re interested in 1950s horror comics, Pre Code Classics: The Unseen Volume One [PS Artbooks; $49.99] collects issues #5-10 [June 1952-May 1953] of the Standard Comics title. A second Unseen volume reprints the remaining five issues. One of the things that struck me about the stories in The Unseen is how many were as straightforward as you can get. A protagonist has their initial encounter with the supernatural. They are told what will happen, be it an attack or a curse of whatever, and then the story moves directly and quickly at that fate. There are a few nicely bizarre tales in this collection. A pair of were-tigers. A man who turns into a giant flesh-eating caterpillar. A killer haunted by a smiling man. Bizarre or straightforward, the stories are entertaining. Otto Binder is the only writer who is known to have written for The Unseen, but the artists have mostly been identified. The artistic roster includes such beloved creators as Ross Andru, Mike Esposito, Alex Toth, Jerry Grandenetti, George Roussos, Jack Katz, Art Saaf, John Celardo and Mike Sekowsky. Fans of 1950s horror comics will want Pre Code Classics: The Unseen Volume One for the collections. I’m a most casual reader of those comics, but I enjoyed this volume and look forward to reading the second one. Swamp Thing Winter Special #1 [DC Comics; $7.99] is a love letter and farewell to Swamp Thing creators Len Wein and Bernie Wrightson. The first printing of this 80-page issue sold out and I’ve read a second printing is coming. Leading off the issue is 40-page “The Talk of the Saints” by Tom King with artist Jason Fabok. It’s intriguing and lyrical, though perhaps a bit more complicated than it needed to be. Filling out the issue is a tribute to Len Wein by DC editor Rebecca Taylor, which also serves to introduce Len’s final story. It was to have been the first chapter of a new Swamp Thing story by Len and artist Kelley Jones. Len plotted the tale, but did not complete the final script before his passing. DC presents the complete art for this first chapter along with Len’s plot. I wish Len had scripting this story, but then, there could never be enough Len Wein writing for my taste. Len was a true wordsmith. He wrote poetically and movingly and descriptively. Of the writers who entered the field just before or at the same time I did, Len might well have been one of my greatest influences. His words set a bar that I constantly strive to come close to. And, though, the Kelley Jones art is Kelley all the way, there can be no mistaking the Wrightson influence in his work. Unfinished symphony or not, this is a tale that will remain with me. 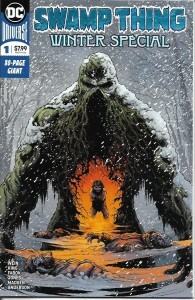 Swamp Thing Winter Special #1 is my pick of the week. 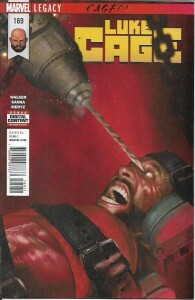 I don’t normally review a comics title two weeks in a row, but Luke Cage #169 [Marvel; $3.99] was a knock-out. Writer David F. Walker finished his “Caged!” story arc in fine fashion. It had Luke being Luke in grand fashion: shaking off the Ringmaster’s mind control, reaffirming who he is, taking names, kicking butts, delivering fine action scenes with a dollop of humor. One of my ongoing complaints about super-hero story arcs is that a great many of them have a great premise and start out wonderfully, only to crash and burn with an unsatisfying ending. This issue of Luke Cage delivers the kind of ending that leaves the readers with smiles on their faces. Well done. Very well done. I’ll be back next week with another trio of reviews and a heads-up on where you can see me in March. Have a great week. I was in New York early last week to be interviewed on camera for a Marvel Comics documentary project on that publisher’s legacy and the creators who shaped that legacy. It was an interesting couple of days, beginning with my too-brief stay at the weirdly wonderful Henry Normal Hotel in a Brooklyn area that was mostly warehouses with a studio or two in that mix. On a chilly early morning walk, I spotted the stages for Blue Bloods and The Good Fight. Beyond my immediate vicinity, there were apartment buildings, shops and very cool eateries like the Little Dokebi Korean restaurant. My “other daughter” Giselle – my daughter Kelly’s best friend since they were wee ones – now lives in New York. I took her to dinner at the above Little Dokebi. Lots of great food at reasonable prices and a chance to catch up with each other. During the long interview, I was asked all manner of interesting, even penetrating questions about comics I’d written, characters I’d created, my background and my process. I don’t know what form this documentary will eventually take or when and how it will be shown. Even if I did, that’s not my news to release. I will say, knowing how many different creators are being interviewed, how pleased I am that so many different creators are being interviewed. You cannot tell an accurate history of Marvel Comics or comic books in general without including the men and women who have labored and continue to labor on these comic books. I was honored to be included in this documentary. First up today is Batman: Gotham by Gaslight, an animated feature directed by Sam Liu, written by James Krieg and based on the 1989 graphic novel by Brian Augustyn and Mike Mignola. In an alternate Victorian era Gotham City, a recent-to-the-role Batman is trying to bring Jack the Ripper to justice. 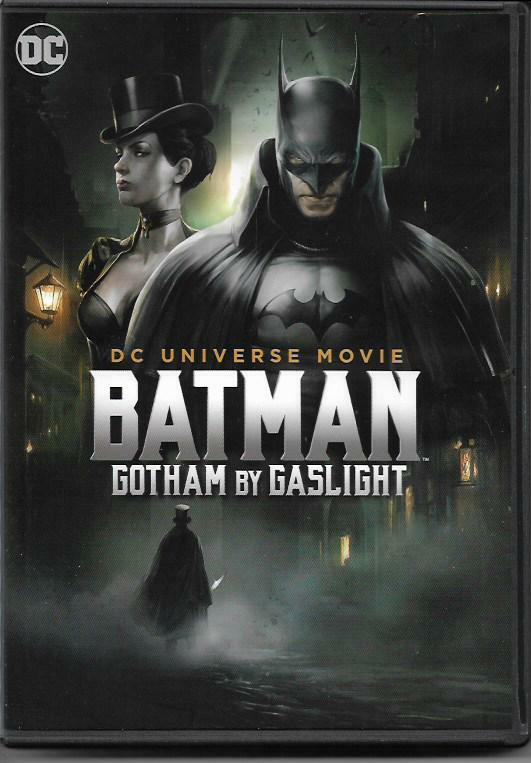 This animated version of Gotham by Gaslight differs from the original graphic novel is many ways. Except some surprises. The first Ripper killing we see involves an alternate version of a popular comics character. Before long, we meet other members of the cast: Bruce Wayne; songstress and former circus star Selina Kyle; Sister Leslie Thompkins, a nun who tries to rescue women from the streets; Alfred Pennyworth, Wayne’s butler and confidant; District Attorney Harvey Dent; Hugo Strange, James Gordon and three young orphans – Dickie, Jason and Tim – who Alfred turns from their lives of petty crime to more noble purposes. I get a kick out of these different looks at DC characters that were such a key part of the publisher’s line of Elseworlds graphic novel. The story unfolds with many surprises along the way. Even when the possible suspects are whittled down, I still didn’t see the reveal of the villain coming. That’s some good red herring there. The acting is good with standout performances by Jennifer Carpenter as Selina, Anthony Head as Alfred and Yuri Lowenthal playing a most unpleasant Harvey Dent. The climatic race-against-time and battle with the Ripper are riveting. The biggest flaw is a not-completely-satisfying ending with too many unanswered questions and unresolved situations. The animation? Not the best I’ve seen in a DC animated feature, but perfectly adequate for the story. Batman: Gotham by Gaslight is my pick of the week. Luke Cage has been one of my favorite characters since the moment I first saw him in 1972’s Hero for Hire #1. There was a grittiness to those early Archie Goodwin scripts that won me over immediately. Later writers might have done some frankly embarrassing Luke Cage stories, but my love for the character endured the bad times while waiting for the good times to return. In recent years, Brian Michael Bendis wrote the best Luke Cage in the history of Luke Cage. Then the Netflix series came along…and did Luke even better. Those are my new standards for what makes a good Luke Cage story. Bendis comes pretty close to those standards in the current Defenders title, but he’s the only comics writer to consistently get within striking distance. Until now. Writer David F. Walker has been writing some pretty good Luke Cage in the current series. I’ve read Luke Cage #1-5 and #166-168. The gap in issue numbers comes from Marvel adjusting issue numbers as part of its “Legacy” movement. I would try to explain the math, but it makes my head hurt. So we have Luke traveling to New Orleans to attend the funeral of an old friend who isn’t actually dead. We learn the old friend is not as good and noble as he was in the original Hero for Hire run. Once that arc was done, Luke ended up in a town and a prison under the control of an extremely scary take on the Ringmaster. I’ve been enjoying Walker’s run, but it’s not resonating with me as much as I would like. I understand the temptation of sending Luke Cage out on the road. Big-city fish out of water and all. Heck, I even did that when I was writing Luke’s adventures. But, when I take a few moments to reflect, it becomes obvious to me that Luke belongs in New York City. He doesn’t ring as true anywhere else. Am I damning Walker’s run with faint praise? I guess so. I do like his work and the title is on my buy list, so I have no qualms about recommending it to you. I’ve been spoiled by the Bendis stories and the Netflix stories, but I still enjoy these new yarns. Check them out and decide for yourself. Luke Cage Vol. 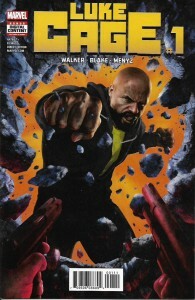 1: Sins of the Father [$15.99] reprints Luke Cage #1-5. It was published last November. Luke Cage Vol. 2: Caged! [$15.99], reprinting issues #166-170, will be published in April. 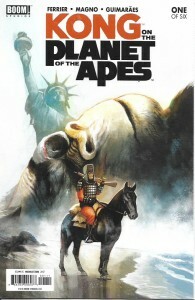 I did not choose wisely when I decided to read and review Kong on the Planet of the Apes #1 [Boom! Studios; $3.99]. While I’m fond of the classic King Kong and even the goofy Japanese movies, Kong of Skull Island is a take it or leave it thing with me. Planet of the Apes? I didn’t like Planet of the Apes even when I was editing a Planet of the Apes magazine for Marvel. I thought the last few moments of the first POTA movie were fun because, geez, of course they were on Earth all along and watching Charlton Heston chew the sand was over-the-top hilarious. So what you have for the big finish of this week’s column is less a review and more an admonition to my myself to make better choices in selecting my comics entertainment. I wasn’t thrilled by Kong of Skull Island, which just seemed to me to go on and one with only an occasional interesting scene. I don’t like Planet of the Apes. I should not have expected this crossover comic to entertain me…and it didn’t. This first of six issues is mostly apes from the original movie talking about how they found a big dead Kong just around the bend from the Statue of Liberty and mounting an expedition to find out what the heck that was all about. A giant monster attacks them at sea and the issue closes with a nicely-drawn image of a live Kong. It was a struggle to get through the issue. If you’re a fan of Kong of Skull Island or Planet of the Apes, you might enjoy this comic-book series. I should have known I wouldn’t enjoy it, but I tend to be optimistic about such things. I do kind of like the notion of King Kong on the Planet of the Apes, but, for me, it probably should have been a comedy-adventure starring some square-jawed human hero blundering through a world of ages of all sizes and unwittingly making salient observations about our real world as he does so. The takeaway from this not-a-review? Not every comic book will or should work for every reader. Choose wisely. February is a crazy busy month for me. Two conventions, finishing up Black Lightning: Cold Dead Hands, pitching ideas for future projects, flying to New York to be interviewed on camera for a cool Marvel Comics project focusing on that publisher’s legacy and the creators who are part of it. It’s why this week’s “Tony’s Tips” is posting so late. Mea culpa. 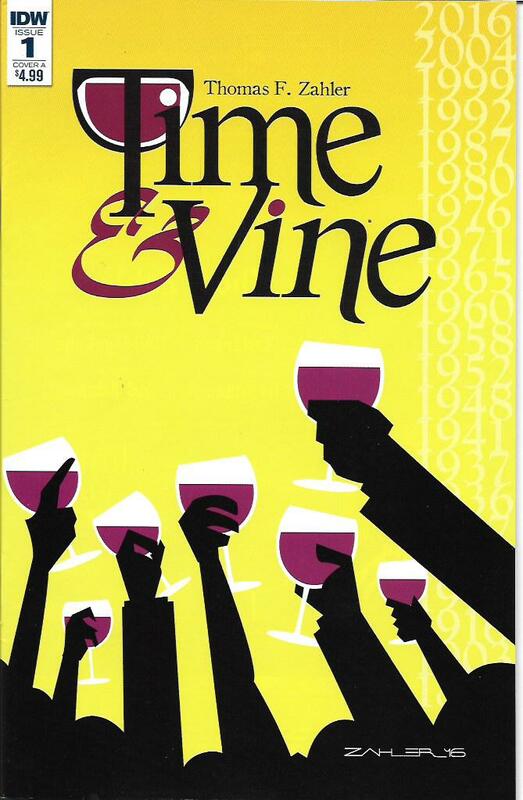 Thomas F. Zahler’s Time & Vine [IDW; $24.99], which collects issues #1-4 of the title, will be published later this month. Drawn in the same animated and inviting style of Zahler’s classic Love and Capes super-hero situation comedy and his critically-acclaimed romance Long Distance, this graphic novel has one of the most intriguing premises in recent memories. There’s a winery in Jefferson, New York. It’s a place of history, of memories and of magic. If you’re given access to its marvelously vast wine cellar, you can have a glass of wine from any vintage of the winery’s long history…and travel back in time to any day of the year that vintage was bottled. As with Zahler’s other series, the emphasis is on the characters. Jack has a past that drives him on their trips. Megan’s mother has a secret the schoolteacher must uncover. The supporting characters, both in the present and the past, are engaging. The attention to historical detail add to all their stories. The reader will come to embrace Jack and Megan as they would dear friends. It’s something I’ve seen in Zahler’s other works and, quite frankly, I’d like to see reflected in more movies and TV shows. I’m amazed the Hollywood powers that be haven’t pursued his creations. The 176-page graphic novel tells great stories with the main story. It has laughs, suspenseful moments and a truly satisfying ending. Though full disclosure demands I mention Zahler is one of my best friends, I would have made this book my pick of the week even if I hated him. Which I maybe do a little, if only because Time & Vine makes me envious of his talents as both writer and artist. I wish Time & Vine would be out in time for Valentine’s Day. But, at any time of the year, it would make a great gift for that comics reader or even that non-comics reader you love. TwoMorrows is known for its comics history and interviews magazines like Alter Ego, Back Issue and The Jack Kirby Collector, but also published Draw!, a fine “how to” journal on comics, illustration and animation and more. Though the magazine, edited by artist Mike Manley, is obviously aimed at artists, there’s a lot here for the writers and just plain fans among us. Issue #34 [$8.95] leads off with a long discussion/interview with Greg Hildebrandt, one of my favorite fantasy, science fiction and even super-hero illustrators. 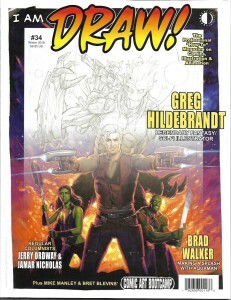 It follows that with Jerry Ordway’s regular column, an interview with Aquaman artist Brad Walker, a “Comic Art Bootcamp” by a dozen different pros and Jamar Nicholas’ regular column on the tools of the art trade. Clearly, as a writer, my work process is very different from that of my artist partners. But knowing how they work and what tools they use, especially what with some of those tools simply not existing when I first started writing comic books 45 years ago, informs what I can expect when they are drawing one of my scripts. Every issue, I learn from Draw! Learning of all kinds will always be of benefit to writers. Learning helps you grow as a writer. So, artist or not, I recommend Draw! It’s an important magazine that doesn’t get the recognition it deserves. This is what it looks like when Hulks cry. Which is another way of saying this is how terrific comics become not-so-terrific. I speak of The Totally Awesome Hulk. 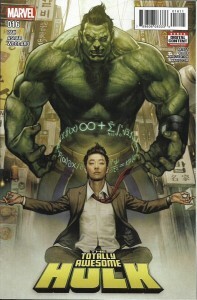 I love Amadeus Cho. Created by Greg Pak and Takeshi Miyazawa, I’ve enjoyed the adventures of this teen genius from the start. One of the smartest people in the Marvel Universe, he’s gone from a great supporting character to curing Bruce Banner and becoming a new and different kind of Hulk. He’s impulsive and prideful, but no other Hulk has quite been like him. He’s been the head of a company and is a member of the new Champions, teaming with other young heroes who, honestly, had enough of hanging out with adult super-heroes more concerned with exercising control and fighting with their old enemies than actually helping people. Following a boring “Weapons of Mutant Destruction” crossover with Weapon X, the “anger and rage” stuff was clumsily introduced into Cho’s life. Been there, seen that. To further disinterest me, Cho then shot himself into space to get a grip on these issues, ending up on Planet Hulk. Been there, seen that. Since the title morphed into Incredible Hulk with the renumbered #709, I’m guessing this is a set-up to revive Bruce Banner and make him the Hulk again. This is what it sounds like when Hulks cry. By all means, seek out Cho’s earlier adventures. They were lots of fun. I’ll continue to read Incredible Hulk in the hope I am wrong about where it’s heading. However, I can’t recommend this current direction.